Training, Policies & Procedures for CFPB Compliance. Get required CFPB compliance training online. Build your personal training program with courses from OnlineEd. Develop the compliance training program required CFPB compliance. OnlineEd offers training in a variety of topics to compliment your company's policies and procedures. All OnlineEd courses come with completion certificates containing backtrack links that can be verified by CFPB auditors, wholesale lenders, and other business partners. OnlineEd offers online NMLS continuing education in most states that require the comprehensive 8-hour program. View our course catalog for details. The most common problem reported by companies being audited is a lack of written policies and procedures. Get equipped with comprehensive company policies and procedures. 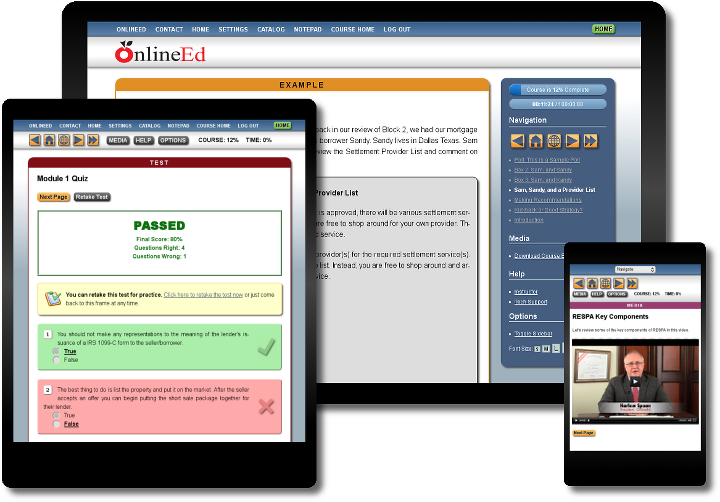 OnlineEd offers a set of pre-written policies that you can use as-is or as a starting point for developing your own. Policies are sold as a Microsoft Word document that you can edit and update to your liking. We currently offer policies that cover Anti-Money Laundering (AML) and Business Compliance topics. There are over 100 pages of tightly written, fundamental policies and procedures. Add, remove, or modify the information as you see fit.